Are Home Prices Finally Pumping the Brakes? Home prices for purchases financed by Fannie Mae and Freddie Mac appreciated at an 0.2 percent rate during June, and the estimate for May was increased from the 0.2 percent originally reported to 0.4 percent. It also appears that April's gain, which was revised last month from 0.1 percent to 0.2 percent has been revised again, up another 0.1 point. The Federal Housing Finance Agency, regulator and conservator for the GSEs, reported that home prices rose 6.5 percent compared to their Housing Price Index (HPI) for June 2017. Prices were up month-over-month in seven of the nine census regions, ranging from 0.1 percent in the West South Central division to 0.7 percent in the Mountain division. Those two states also posted the smallest and the largest year-over-year changes, 5.0 and 9.5 percent respectively. The two regions where prices fell were New England and the South Atlantic, both down 0.4 percent. The June report also contains information on prices for the second quarter of the year, and that period saw a gain of 1.1 percent compared to Quarter One. All 50 states and the District of Columbia posted increases between the second quarters of 2017 and 2018, with the highest appreciation in Nevada at 17.0 percent and Idaho, 13.0 percent. The District of Columbia, Utah, and Washington all had gains at or exceeding 11 percent. 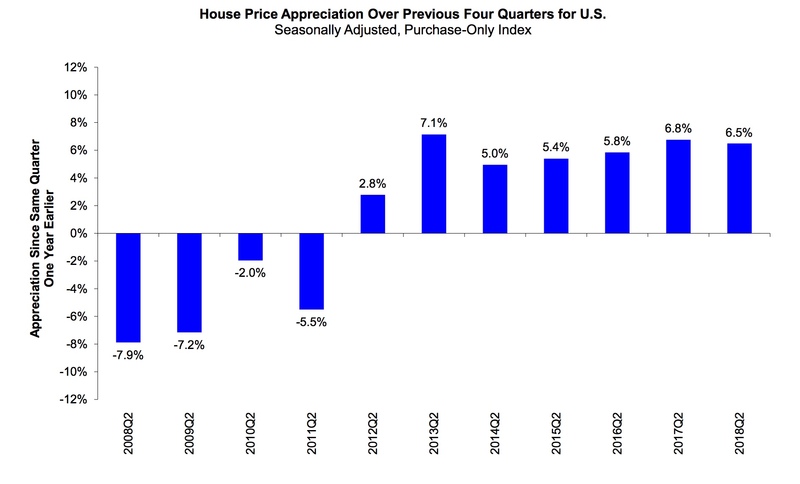 "Home prices rose in the second quarter but at a slower pace than we have seen for the past four years," said Dr. William Doerner, FHFA Supervisory Economist. "Mortgage rates have increased by more than half a percentage point over the first six months of the year. Rates are still inexpensive from a historical standpoint, but their bump-up appears to have gently pressed the brakes on house price increases." The FHFA HPI was indexed to 100 in January 1991. The index reading for June 2018 was 264.0.